Entries for the Hoard will be accepted until the last day of November, 2018. I know it seems early, but it's getting close to that season. I hope to make this into a 3d model with snowy owl wings, but I will probably also just do a double sided mini of this. I'm currently working on some desert people, I suppose I could give them Santa hats to help them fit in. I would like to try to do the winged one without the black outline to see if it can work. My plan is to fold and cut out the wings first, cut slits in the sides of the deer and put the wing tabs through the slits before glueing the deer together. Don't know when I will test build, but that is the plan. I guess it should have some kind of flying base, but I haven't thought that through yet. 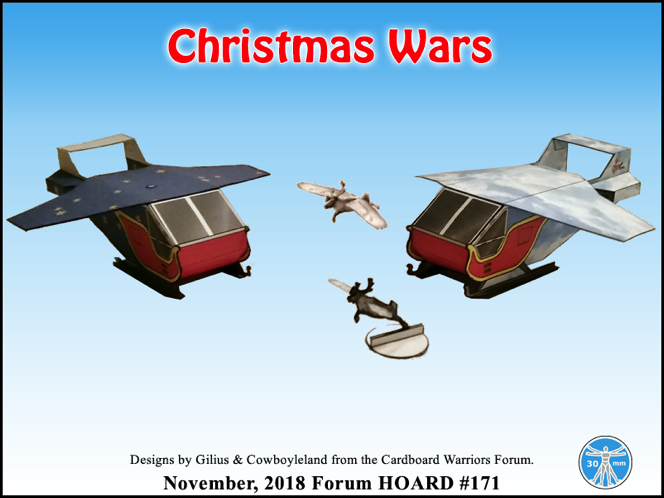 I will be redesigning the landing skids for the sleighs, which with the current design is the weak point. Fine for gaming, but not little kids. I'll get to them at lunch or tonight. For the two versions, I worked on a new texture last night. The solid blue livery is going to be swapped out with stars on a blue background. So Daylight Clouds and Night Time Stars. I'd already adjusted the windows, but I had delayed printing them off until I redesigned the skids. Now I'll have room to print Bessie's seats on the pages I print, so I can show that progress. As I am sure most of you suspected, I need to thicken the antlers. And I think I will simplify them while I am at it. On the other hand, with this model being as light coloured as it is (especially the wings), I think leaving off the black border was the right choice. I see on your build, you omitted the tabs. How will you be basing this fine fellow? My long term plan (maybe by next year?) is to build eight 3d versions of this creature and a sled with stiff wire runners which has a hidden loop of wire under a fake snow base so that it looks like it has just the back of one runner touching the ground. Then the traces for the deer are also made out of wire so it looks like they are flying. This is my long term plan. Short term I suggest a bit of clear packaging glued into the belly for a flying base. I will make a template for the plastic, which I guess people could just use as a paper base, if they like. As you suggest, a bit of thread through the shoulder hump would let it be an ornament. I am nearly done with the simplified antler version. I will post that soon. The one above with the tab and the outline might have antlers thick enough. For these, I used the antlers found on a Canadian quarter. I don't remember much about the different shows I have seen on reindeer, but I think they are part of the caribou family, and the antlers have a fuzzy stage, the thicker antlers, and then later, after they have scraped off the fuzz, you get down to the narrower antlers. You are correct. I actually had to "photoshop" out a little scrap of skin that was dangling from the antlers in the original image. Nearing the end of the month. Yes, I'll have my Christmas Dessert warrior up tomorrow. There will be a slight delay as I learn how to draw figures on my phone. The recent earthquake hammered my workroom and tossed my laptop around quite a bit. My backup iMac flew six feet across the room, I don't think it works either. The earthquake broke something in every room of my house and rendered three of my seven theatres inoperable due to structural damage and flooding, so work is also pretty exciting. The worse the situation, the funnier I get. I think I get it from being around firefighters and commercial fishermen. Three out of seven theatres sounds bad. Glad you are ok.
Just realised that I promised to make a flying stand for the reindeer. I don't know if it is worth it, but if you want to include it, here it is. As squirmydad has had an unexpected earth-shaking situation, I'm closing this and getting things ready to process. It's Christmas and Santa's got a brand new bag!